This Saturday afternoon I took on hike number 9/52 for the 52 Hike Challenge in 2015, and 82 of my goal of 100 miles this year. 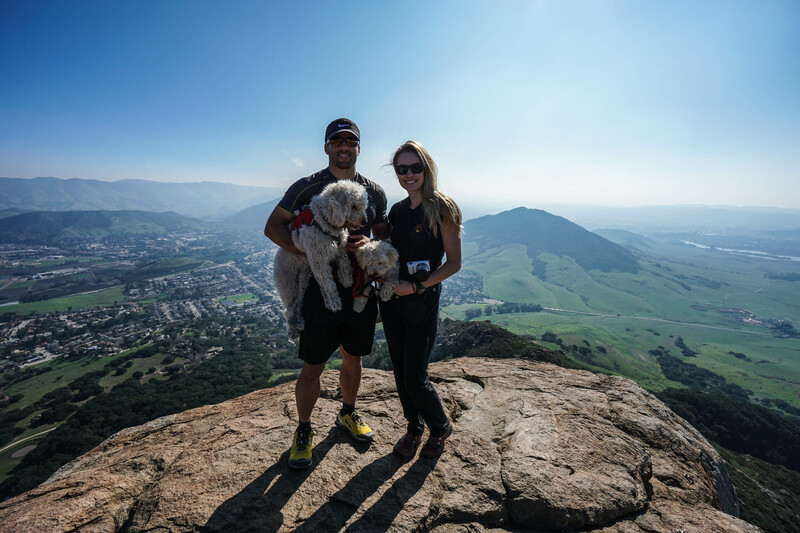 After hiking Shell Beach Bluff and Ontario Ridge loop in the morning, I wanted to do my favorite hike in the area, Bishop Peak. With an elevation of 1546 feet, this hike gives you a bird’s eye view of Cal Poly and all of San Luis Obispo. Bishop Peak is also the tallest of the 9 Sisters, a chain of volcanic peaks between Morro Bay and San Luis Obispo. The 9 Sisters were formed 20 million years ago as volcanic plugs of magma, and make for a spectacular backdrop in San Luis Obispo County. I started this hike of Bishop Peak from the trailhead entry of Highland Dr. with Julia, Lilly, and Isla. The weather was spectacular, and as expected, the hikers were out in full force. This is usually something that I find off-putting, but being back in my old college town it was really cool to feel the positive, young, campus atmosphere. There were also a lot of dogs on the trail, so Lilly and Isla were equally excited and enjoyed their company. Even though I hike this trail every time I visit the Central Coast, I somehow seem to forget just how much I love it and vow to return much sooner than I ever do. It’s a short 1.5 miles to the summit with great views the entire time. The peak is the real charmer though, as it offers some of the best views of San Luis Obispo you’re likely to find. We made it to the top and carried the dogs the final few feet before relaxing to take it all in. And….another hike to add to my “to do” list! Great view from the top! This is one of my favorites! Definitely give it a shot if you have the time! Beautiful views! Also, awesome dog.